Farrokhroo Parsa (1922-1980), Iran’s first woman cabinet minster to the Majlis. A 1968 newspaper report of iranian female PhD nuclear scientists. The report notes that “One fourth of iran’s nuclear scientists are women”. Dr. Talaat Basari, the first female vice-chancellor of an Iranian university. Dr. Basari held this post at the Jundishapur university. Iranian female police officer in the 1970s. 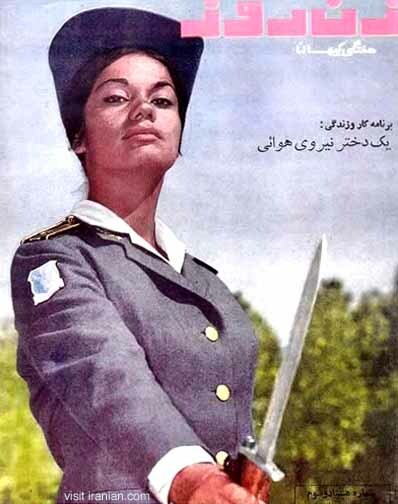 Iranian female cadet of the Iranian Air Force of the 1970s.